NEWPORT NEWS, Va. U.S. Navy officials modified an existing contract with Huntington Ingalls Industries' (HHI) Newport News Shipbuilding division for a multiship contract valued at $15.2 billion. 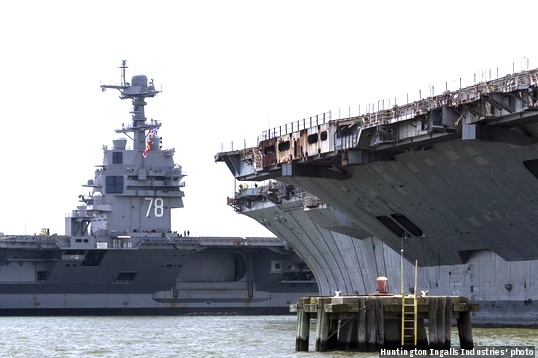 HHI will design and construct two Gerald R. Ford-class aircraft carriers designated Enterprise CVN 80 and CVN 81. This contract modification comes after previous contract awards for the advance procurement and advance fabrication of Enterprise, starting in May 2016. The construction of Enterprise, which began in 2017, and CVN 81 will be completed at the company’s Newport News Shipbuilding division. The ships are scheduled to be delivered in 2028 and 2032, respectively. Buying two aircraft carriers will stimulate Newport News’ aircraft carrier supplier base of more than 2,000 suppliers in 46 states, allowing businesses to phase in work more efficiently. These benefits will help accelerate production, enabling the company to build aircraft carriers every three to four years. The Navy’s decision to partner with HII to create the best acquisition approach will save more than $4 billion across the program, officials report. To support the contract, the company is making investment in facilities and will continue its digital transformation efforts.